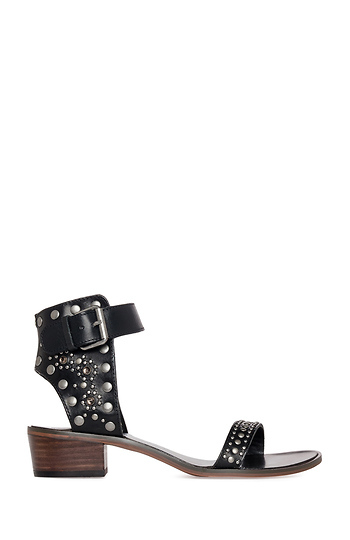 Sandals with a chunky low heel, studs across toe strap, studs on toe strap, studs and rhinestones on ankle enclosure, and an adjustable buckled ankle strap. By Chinese Laundry. I love these! Thank goodness they worked out cause I bought them when they were on final sale. FYI, if u own shoes from Chinese laundry just order them the same size you ordered before. At least that's what I did and it worked for me on both of the Chinese laundry shoes that I ordered on final sale. So good luck!